The Nigerian Army has debunked rumours that the leader of the Islamic Movement of Nigeria, Sheikh Ibraheem El-Zakzaky, was arrested by soldiers at his residence and his wife killed. The assertion was made by the General Officer Commanding (GOC) 1 Mechanised Division of the Nigerian Army, Major General Adeniyi Oyebade, in company of the Kaduna State Commissioner of Police and other senior Army officers on Monday. General Oyebade disclosed that the Islamic cleric and his wife were rescued alive during the bloody clash between the sect members and soldiers, adding that they were in the Army protective custody. He narrated how members of the movement attacked the convoy of the Chief of Army Staff, Lieutenant General Tukur Buratai, who was on his way to pay a courtesy visit to the Emir of Zazzau. According to him, the Shiite members blocked the Army Chief’s convoy along Sokoto Road in Zaria, and attacked his vehicle with dangerous weapons. The General stressed that all entreaties by some senior officers for the sect members to leave the road were resisted, a situation which he said prompted the soldiers in the convoy to apply minimum force against them. General Oyebade said that the sect over the years, had taken laws into their hands, unleashing terror on innocent citizens within the places they have their shrines and activities. 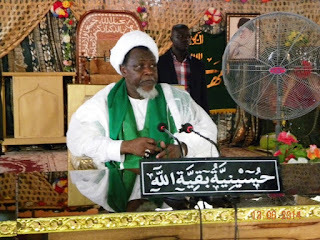 He warned sect members within the Northwest zone to be law abiding and not to unleash violence on security forces and members of the public as such action would not be condoned by the Army.